You might be surprised to learn that the two entertainment luminaries don't entirely hate the 3D trend that Hollywood is currently hot for. Filming in 3D has been around for a long time, but Avatar made it work for relatively mainstream films instead of just horror and shlock. Some people hate the format, but Joss Whedon and J. J. Abrams, arguably two of the most influential creative forces in the industry today with such credits as Firefly, Buffy, LOST, and Star Trek under their belts, think that 3D has a lot of potential, even if it doesn't work with every film. "Honestly, I'm totally into [3D]. 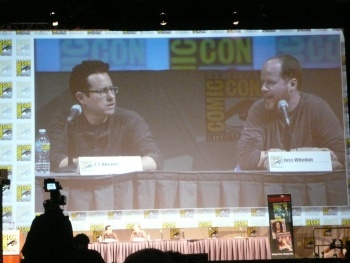 I love it," Whedon said during his panel with Abrams at San Diego Comic Con. "I really think that the technology is really good. It puts you into the space. It doesn't give me a big headache. I think that it's being done so much now that we're past the poke-things-at-the-screen era of 3D and it just adds a little something. There definitely are movies that shouldn't be in 3D, say like Cabin in the Woods..." Whedon is referring to the horror film that he produced, directed by Drew Goddard, that has been slated to be transferred to 3D. "That came about because [MGM] looked at the schedule and said, 'Oh my god, every horror movie is going to be 3D forever,'" Whedon said. "But Drew shot something very specifically, in a classical mode. He made it almost a little old-fashioned. So what we're hoping to do is be the only horror movie that's not in 3D so we can advertise, '2D! See things move across the screen! Cabin in the Woods is painterly!' It's going to revolutionize the industry." "The thing with 3D is that everything gets dim," Abrams said, taking the more cautious approach. "It all feels a little grey and muted. I want to see the vibrant [colors], I want to see the movie. I get into it I adjust to it, but for me it always feels like those first five minutes feels less than the IMAX experience, which is my favorite kind of immersive experience. The 3D thing, I'm not totally on board with yet." Is 3D just a fad or is it here to stay? "I have no idea," Abrams said. "My guess is that it will continue, the equipment will be there, the technology will improve. Not everything will be made in 3D but a lot will. I have no idea." Abrams was clear about one thing. When asked whether his project with Steven Spielberg, Super 8, will be coming out in 3D he simply said, "No."